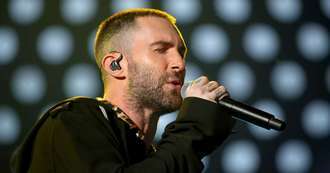 Adam Levine and his bandmates revealed earlier this week that they had teamed up with Bodak Yellow star Cardi B to revamp their album track, and they released the star-studded video for it late on Wednesday (30May18). In addition to guest star Cardi, the video features ladies from the music world, like Mary J. Blige, and acting world, such as Millie Bobby Brown, Gal Gadot, Tiffany Haddish and Sarah Silverman, as well as talk show host Ellen DeGeneres and model Ashley Graham. In the video, Adam stands in the middle of a circular studio singing into a microphone and the camera slowly rotates around him in a full circle, revealing a female star dancing and lip syncing to the song behind him, facing away from him. Each time the camera returns to the front of Adam, the celebrity is replaced by another one. Some of the stars come together to stand in a circle facing outwards during the chorus. The last person to appear behind Adam is his wife, Victoria's Secret model Behati Prinsloo, who is holding their 20-month-old daughter Dusty Rose, and the singer turns around and hugs them both as the song ends. The couple welcomed their second child, a daughter named Gio Grace, in February. "Thank you so much to everyone involved with this very special project; honoured to share this with you all!" Adam wrote on Twitter as he promoted the video. Sarah shared a screengrab of the footage and tweeted, "Ya no big deal I'm in a @maroon5 vid" and Ashley did the same, adding, "Had SO much fun shooting my scene with @adamlevine! Love this video and song, congrats @maroon5."